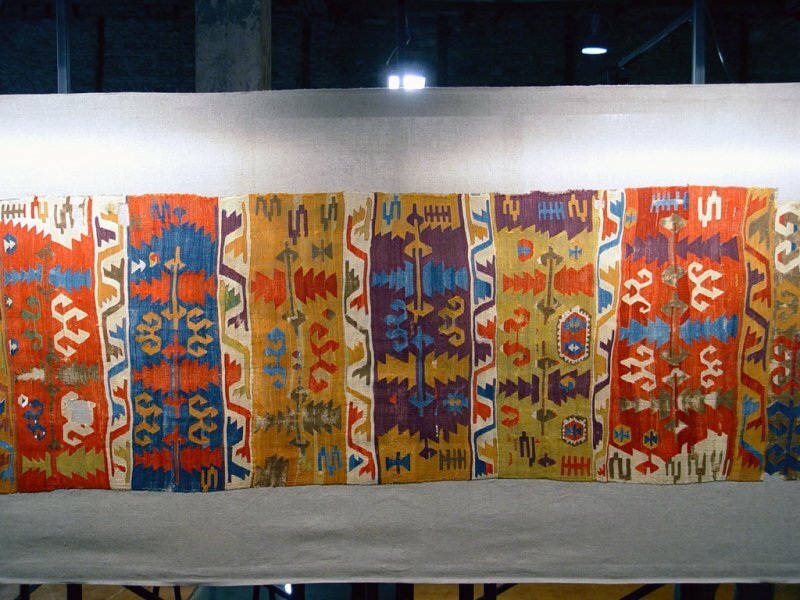 One half of a ‘taban kilimi’ (floor rug), an identical (symmetrical) second part to be added by sewing them together. The junction was entended tob e at the upper border, as it is more straight than the lower edge. Nomadic looms do not permit the weaving of wide rugs (as they must be movable, they are smaller than fixed looms) and – if they are moved during the weaving process – even keeping the edges straight is difficult. One of the recurrent motifs on this kilim is ‘koçboynuzu’ (ram’s horn), symbol of male fertility, heroism, power and masculinity. Amongst the smaller motifs scattered all over the rug, the double combs and the S-shaped hooks are easily recognizable. A comb motif with five lines generally refers to a ‘hand’ (Turkish: ‘el’), which is a protective sign against spell and evil eye; the comb is related to the protection of marriage and birth. The ‘çengel’ (hook) too is a protection against evil eye, used to reduce the effect of the evil glance, which is believed to be a power possessed by some people, that causes harm, injury, misfortune and even death.